The FryPod functions well and is priced beyond competitively, but does its small size make it less attractive? It is the perfect Size & Weight for a single person, or even a couple (depending on what you're making), and its very low Learning Curve means that it is ready right out of the box. The only real issue with the FryPod is in its Build Quality. The quality of the plastic used in the front of the tray might be too low for the heat it lives around. If you are a single person or a couple looking to cooking healthy at home, this is an inexpensive yet quality product that will make it easy and convenient. At its MSRP, which is $130, the FryPod is a great deal for anyone looking for an easy and healthy way to cook at home. The going price on Amazon, however, is far below MSRP, making it an amazing deal. Having used it for several months, I would say that any price below $100 would make me buy one of these for my own kitchen. This is a wonderful product for any single person or couple. The Design of the FryPod Air Fryer is perfect for a small kitchen. Since it's designed for small usage, likely a single person or a couple, its small footprint is great. The cooking tray is almost half the overall size of the body, meaning the design was optimized for usefulness. The placement of the control buttons, on a 45-degree angle facing upward, makes seeing them and interacting with them easier. The controls are also capacitive buttons, meaning that there is no seam around them for food to get stuck in, and no physical button underneath to wear out. The aesthetics of the fryer are also well planned: the black and silver coloring look modern while not standing out as inappropriate in a classicly designed kitchen. No product is perfectly designed, however. While the controls are on the upward facing top panel, the screen is on the front of the canister body, facing toward your chest if placed on a standard height counter. This is despite the large space available on the angled top panel, which would have faced the screen toward the user's face, rather than their chest. As it is, when you are programming the fryer, having the screen and controls facing different directions is definitely frustrating. Cleaning the FryPod Air Fryer is fairly easy. The inside of the product is very easy to wipe down with a cloth. You merely need to get the inside of the rounded canister and the heating element at the top of the opening. The tray is a little bit more difficult to clean. It comes in 2 parts: the tray itself and the metal crisping insert. The tray wipes out easily, but the crisping insert does not. There is an indent in the center, a circle with a diameter of about an inch, that has a cross-bar over the top. This gap makes cleaning under it pretty difficult, though the mesh nature of the crisping insert makes it a little easier. Overall, the packaging for the FryPod is what you would expect. There are not a lot of individual pieces in the box; mostly just the fryer itself, the instruction manual and a cookbook. The box is way taller than the fryer itself, about 20% more height than the actual product. The extra space is taken up with styrofoam, which definitely kept the product from getting damaged during shipping. The only real annoyance of the packaging is the strength of the tape that holds the device together during shipping. Pulling all of the pieces of tape off took longer than actually opening the box and removing the components, Unboxed video included. The FryPod Air Fryer is incredibly easy to learn. In fact, since it is such a focused product, there is very little to know. Place your food in the tray, press the power button, set the time and the temperature and walk away. Once the timer expires, the fryer will beep to let you know. The only aspect of the product that you will need to learn is the idiosyncrasies of air frying as a method. For example, you should flip whatever you're cooking halfway through so you get an even cook. The good news is that the fryer comes with a great recipe book which gives ideas for use, as well as timings for commonly fried foods, such as chicken wings and French fries. Overall, the Build Quality of the FryPod Air Fryer is higher than the average kitchen appliance in this price range. All of the non-movable plastic seams are flat with no sharp edges, and the materials used all make the product feel premium. The only issue we encountered was the seam around the cooking tray. After 20 or so uses, the upper corners moved out slightly. The gap does not release any heat from the system while in use, and it is not enough for anything to catch on the corners or to produce sharp edges. Over the following 20 or so uses, no additional adjustments have happened. All aspects of the FryPod work exactly as you would expect, making it the most usable kitchen appliance we have tested. The Learning Curve is not steep, meaning it was really easy to get going from the moment we opened the package. Once we tried it for the first time, we were inspired to try new recipes, which was made easy because of the straightforward nature of the device. The buttons all work well and trigger fairly easily. The solid-state buttons also make it much easier to use, especially if your fingers aren't entirely clean. The only thing that would make the functionality 100% is if the screen showed both statistics at the same time. As it stands, it flips back and forth between current temperature and remaining time; waiting for the screen to slip to the other number can be a real annoyance. 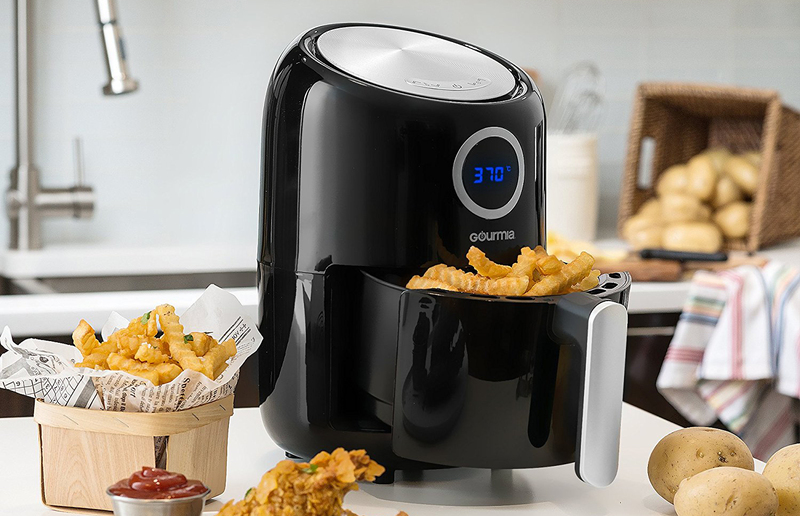 The FryPod Air Fryer is the perfect size for its intention. At 2.2 quarts, it is the perfect size for a single person or possibly a couple. Its footprint is very small - about the size of a small coffee maker. This means that it doesn't take up a lot of space on the counter, so you don't necessarily have to put it away between uses. The weight is also incredibly low, which means that if you do need to take it off of the counter between uses because you have limited surface area, or while you are cleaning, it will not be inconvenient or difficult. The FryPod Air Fryer is literally a plug-and-play device. Other than removing the Packaging and an initial cleaning before usage, there is nothing special that needs to be done before you use the product. Within 10 minutes of opening the box, we had our first batch of steak fries cooking in the tray.